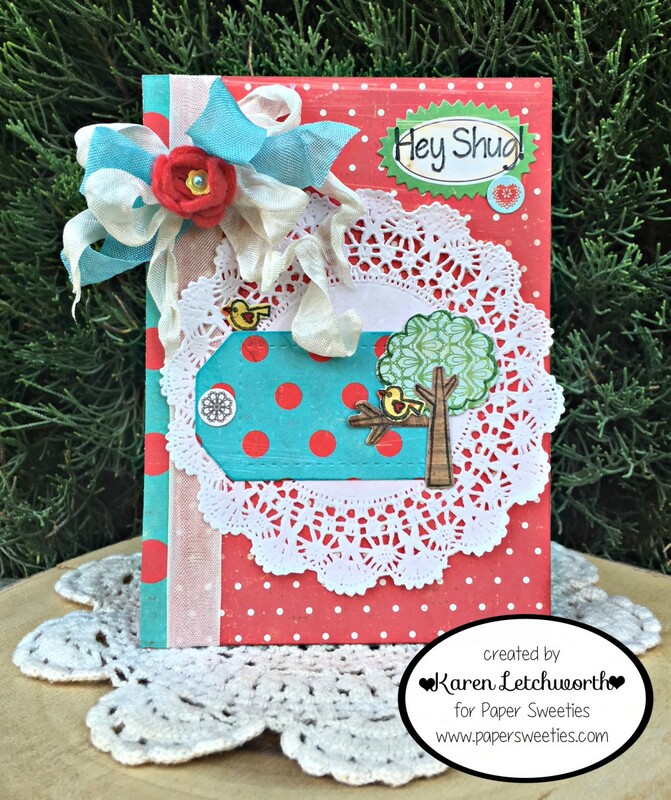 I'm so glad you're here again today as my Paper Sweeties teamies and I wrap up the new June Release. If you happened to miss my project posts from yesterday and Friday, you can find them by clicking on each day's colored links. I combined this month's sweet new sets with some of my other Paper Sweeties favorites. That's what I love most about Paper Sweeties Products (well, besides the fact that they're ADORABLE) is that they all compliment one another SO well and look so darn sweet together. Paper Sweeties embellishments like Seam Binding and Sequins are even more "icing on the cake". It's like cuteness, on top of cuteness, on top of even more cuteness. So, for this card I attached some patterned papers together, and then ran a length of Frosting Seam Binding up my card and tied a bow with that and some Robin Egg Blue Seam Binding. I fell in love with this idea when I did for my card on Friday, so I used the idea again for this card to top my bow. I used the smallest circle in the Circle Scallop Sweet Cuts and cut it from a pinkish red wool felt. I took the outer scalloped circle, and snipped it. Then, using craft glue and a toothpick, I carefully rolled the scalloped piece into the darling little rosette you see placed in the center of the Seam Binding bow. I placed a sweet Cookie Dough Sequin in the center of the rosette. The larger circles in the Circle Scallop Frames Sweet Cuts could also be used to cut larger pieces to help you create larger rolled flowers. It's a great idea, was very easy, and achieved a really sweet result. 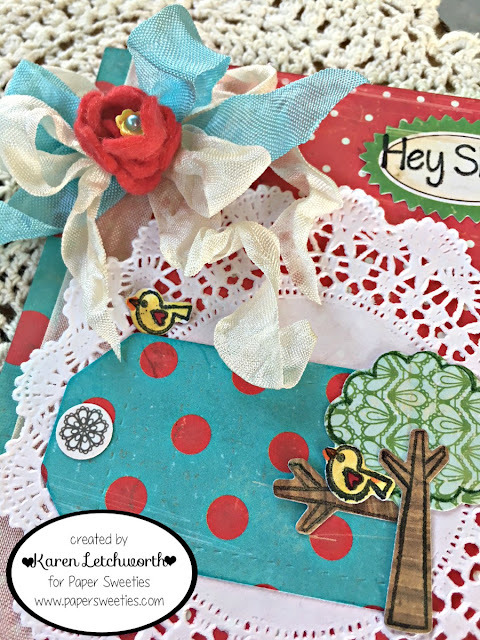 I used the new Treat Box Home & Garden Add-Ons Stamp Set and coordinating Treat Box Home & Garden Add-Ons Sweet Cuts to create the tree, branch, and birds. I cut the polka dot tag using Stitched Tags #1 Sweet Cuts. And finally, the sentiment (Hey, Shug!) is from last month's ADORABLE new Hey Y'all Stamp Set. Here's the list of all my fabulous Paper Sweeties teammates who have created some inspiration for you today using these sweet new sets (and some their other favorites as well). I sure hope you've enjoyed this month's release party. How cute and happy card! Love so much the little scene you have created and the bold colours!